Salve Regina by Diogo Dias Melgás (1638-1700), who, while living well into the Baroque period, was very conservative in his musical style. The works themselves vary in mood, but tend towards the dark and meditative style prevalent in the Iberian peninsula during the 16th and 17th centuries. Morago’s calm and homophonic O Magnum Mysterium is a little gem of quiet, and I hope to sing it with my choir this coming Christmas. The incredible setting of the Salve Regina by Melgás is very unique; it employs an almost madrigalist word-painting and audacious chromaticism. Starting with the plainchant incipit, it moves slowly and homophonically through the first part of the text, arriving at "clamamus" with a series of surprising and descending chords. "Ad te suspiramus" is heavily accented by the breaking up of the word with a rest between each syllable. The dissonatant "flentes," the haunting "lacrymarum vale" are agin accentuated by a series of arresting chords. 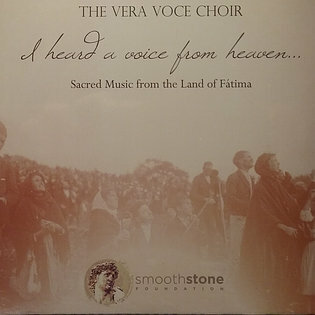 Duarte Lobo’s Audivi vocem de caelo is, in a way, the album’s title track, taken from Lobo’s Requiem Mass, setting the text: “I heard a voice from heaven saying unto me, Write, Blessed are the dead which die in the Lord.” With brilliant lines of polyphony that slide past each other in a dance of dissonance and consonance, I find this one of the most powerful pieces on the recording. On the word "mortui" Lobo uses long wailing melismas, ultimately leaving the piece eerily unresolved: the last chord of it will fall into place when we ourselves die, blessed, in the Lord. That is the sort of impression one gets from the music. Timothy McDonnell conducts the Vera Voce choir for this recording. Overall they sing the repertoire extremely well. The ensemble has a good sense for the music. The sound quality or timbre of the voices is a little cool; perhaps the acoustic in which they were singing was not exceptionally reverberant. However, they have good intonation throughout, with a supple feel for dynamics and cadences. The singers are well-balanced in their straight-tone style (none of the "death by soprano overdose" problem that so many Renaissance recordings have). All in all, this recording is both intriguing for the obscurity and beauty of its repertoire, while also being eminently listenable. I highly recommend it as an addition to your Iberian and/or Marian polyphony collection. It is availible from the Smooth Stone website for $25. From visiting the site, one can see the variety of projects this and other items for sale are supporting.